Our invention relates to an electrical generator, particularly a converter generator which presents a low static torque and is capable of providing high voltage output at low driving speeds. 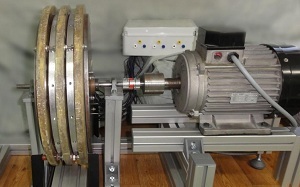 It optimises the use of the magnetic material by using a permutation of connections with the possibility of providing a poly phase motor. The windings and magnets are positioned in way to provide a phase shift thereby resulting in a smoothed DC output after rectification without the need for regulation. By optimising the use of magnetic material and copper, as well as eliminating the need for regulation, our solution delivers a number of advantages such as exploiting the optimum power out of the magnetic material, reducing overall size of the drive for the same power output and offering a better power to cost ratio. The main cost reduction comes from the reduction in use of rare earth metals. Ultimately, it reduces cogging, increases efficiency and obtains better power to size ratio. On the other hand, it also addresses the problems with the prior art such as sensitivity of capacitors to temperature, contaminants and corrosive or catalytic materials (e.g. salty, marine environments). An advanced working prototype has been developed as shown in image below. The University of Malta submitted a patent application (application no. 1421787.1) in the United Kingdom. We are looking for potential licencees and collaborators to manufacture and sell our invention.